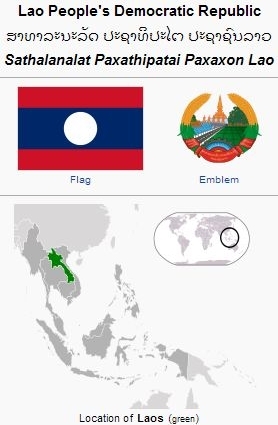 The Lao People's Democratic Republic is located in Southeast Asia. It is bordered by Burma and People's Republic of China to the northwest, Vietnam to the east, Cambodia to the south, and Thailand to the west. The country's total area is 236,800 km2 (91,429 sq. mi.). In 2013 the estimated population of Laos was 6,695,166. Laos traces its history to the kingdom of Lan Xang, which existed from the 14th to the 18th century when it split into three separate kingdoms. In 1893 it became a French protectorate with the three kingdoms, Luang Phrabang, Vientiane and Champasak, uniting to form what is now known as Laos. It briefly gained independence in 1945 after Japanese occupation, but returned to French rule until it was granted autonomy in 1949. Laos became independent in 1953, with a constitutional monarchy under Sisavang Vong. Shortly after independence, a long civil war errupted between the Royal Lao Army and the communist Pathet Lao. Laos eventually became involved in the Vietnam War when the North Vietnamese began using the country as a supply route for its war against South Vietnam. This led to a massive bombing campaign by the United States between 1964 and 1973, including the use of cluster bombs. In 1975 the Pathet Lao overthrew the monarchy and established a communist govermment. Most of the nation's people live in the valleys of the Mekong River and its tributaries. Ethnically the population is divided three major groups based on their altitudinal distribution. The ethnic Lao, known as the Lao Loum, comprise approximately 60% of the country's population and live in the lowlands. The midland people, known as the Lao Theung, include the Mon-Khmer tribes and constitute approximately 30% of the country's population. The Lao Soung, including the majority Hmong, live in the highlands and constitute approximately 10% of the population. According to the 2005 census, 67% of Laotians are Theravada Buddhist, 1.5% are Christian, and 31.5% are other or unspecified (mostly practitioners of Satsana Phi). Mennonite Central Committee (MCC) placed its first representatives in the capital city of Vientiane in 1975. This was a time of uncertainty and transition, since Laos had just been through a major war and had suffered intense bombing by the United States. Early MCC assistance to Laos focused on increasing food production and helping displaced families resettle in their home villages. In 1981 MCC shifted its focus to village level, locally sustainable education and health programs. MCC also began working with officials of the heavily bombed province of Xieng Khouang to clear fields and villages of unexploded ordinance. In 1987 MCC had two volunteers involved in projects in 11 of 16 provinces. Wikipedia. "Laos." 11 May 2014. Web. 13 May 2014. https://en.wikipedia.org/wiki/Laos. Stauffer, Brenda. "Laos." Global Anabaptist Mennonite Encyclopedia Online. May 2014. Web. 24 Apr 2019. http://gameo.org/index.php?title=Laos&oldid=122097. Stauffer, Brenda. (May 2014). Laos. Global Anabaptist Mennonite Encyclopedia Online. Retrieved 24 April 2019, from http://gameo.org/index.php?title=Laos&oldid=122097. This page was last modified on 13 May 2014, at 15:22.